The Dark Hold is a book of dark magic in the Marvel universe. It is the one of the most powerful and famous items in the Marvel Universe. The book is often considered the inverse of the equally powerful Book of the Vishanti. The book has been held by a variety of powerful characters including multiple vampires, Doctor Doom, Morgan Le Fay, and even Doctor Strange. The item was popular enough that a series was created called Darkhold: Pages from the Book of Sins that ran for 16 issues between 1992 and 1994. The Darkhold is shown and mentioned in the MCU show Agents of SHIELD Season 4. The Darkhold is said to have been created by the elder god, Cthon who was also the first pracitioner of dark magic. Cthon was something of an academic and put down a great deal of dark magic into iron bound scrolls that eventually became the Darkhold. The Darkhold was found and used by sorcerors of ancient Atlantis who called themselves the Darkholders. During the fall of Atlantis the warrior Kull slew the leader of the Darkholders, Thulsa Doom. Hoping to defeat Kull the remaining acolytes of Doom used the Darkhold to create the world's first vampire Varnae. Varnae did not want to be controlled by the Darkholders and quickly killed one and escaped creating his own army of vampires. Darkholders escaped Altantis with the Darkhold. Since that time it has fallen into a variety of powerful magic users hands. Pages of the Darkhold have also been copied into diaries and other nefarious magical books like the infamous Necromonicon. The Darkhold is shown and mentioned in the MCU show Agents of SHIELD Season 4. Experiments by a high tech group have left its members in a ghost like state. When they touch people or phase into them they cause a person to become overloaded with fear and homicidal. The ghost researchers seek to find the book the Darkhold that they hope holds the key to revert them to their normal physical state. The scientists that found the Darkhold appear to have found it the basement of Johnny Blaze. This is not spelled out in the scene but there are a few huge clues that point directly to Blaze. 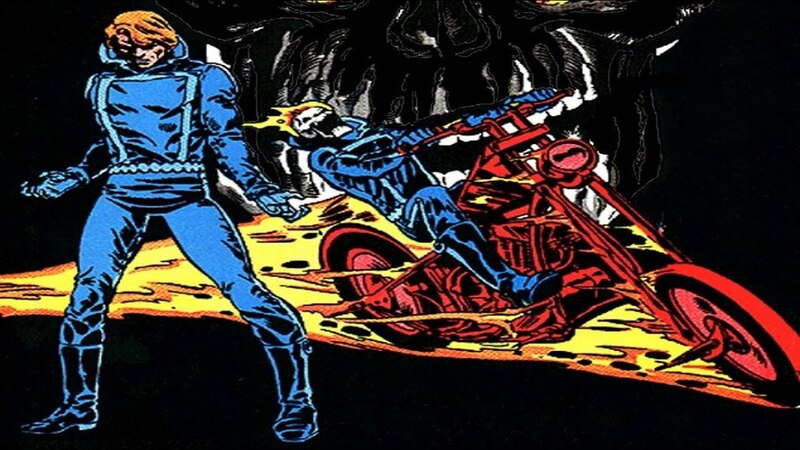 Johnny Blaze was a stunt motorcycle rider in a carnival before eventually becoming the Ghost Rider. The first clue is that the scientists say they were entering the basement of the person known to have killed the last person who held the Darkhold. This is very much something that Ghost Rider would do. Then in the basement there are a variety of clues that point toward Johnny Blaze. There are motorcycle helmets, parts, wheels and tools. There is also a poster for the Quentin Carnival which was the home and work place for Blaze and his family. Being that the scientists discovered the Darkhold many years earlier and that Blaze's basement appeared to have been left abandoned it means that Blaze in the MCU is likely older. He may have operated as a hero in the 90s, 80s or even earlier. It could be that the MCU plan with Ghost Rider is similar to their approach with Ant-Man. They made the historical and original Ant-Man Hank Pym older allowing for him to mentor the newer Ant-Man in the modern age. Who had Johnny killed to acquire the Darkhold? Not sure but there are many Marvel villains who have had the infamous Darkhold in the comics.